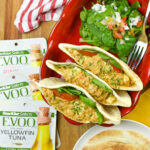 Eating healthy can be a challenging task for me at times so I figured why not make it an enjoyable experience. I looked up the nutritional gains of eating asparagus and realized there are quite a few health benefits. Asparagus helps fight cancer, is a natural diuretic, good source of fiber and is rich with vitamin B6 which gives you a boost of energy. 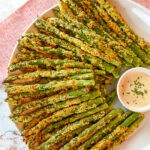 Asparagus is one of my favorite spring vegetables. However, while the most of the tender asparagus is edible; the end is not so appealing. 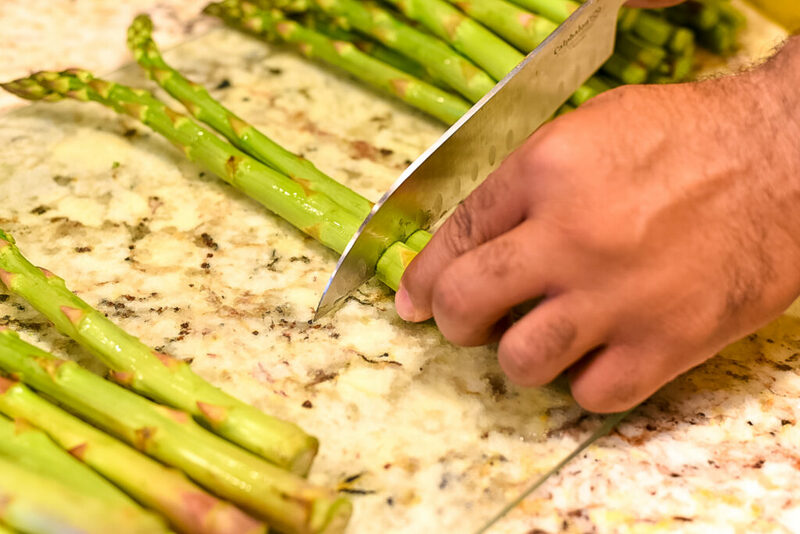 Once you remove the tough and woody stem (or the very bottom), only juicy asparagus remains. Covering trimmed asparagus spears in egg batter. 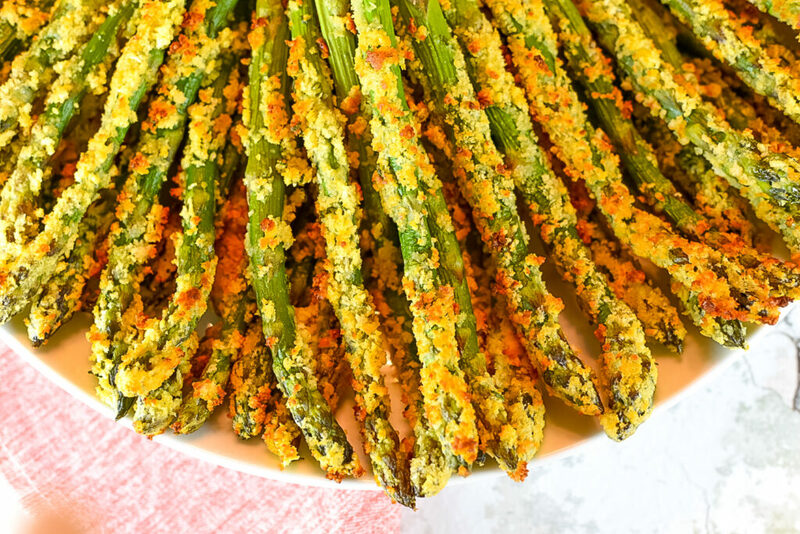 Today I’m bringing you my Parmesan Crusted Asparagus Spears. 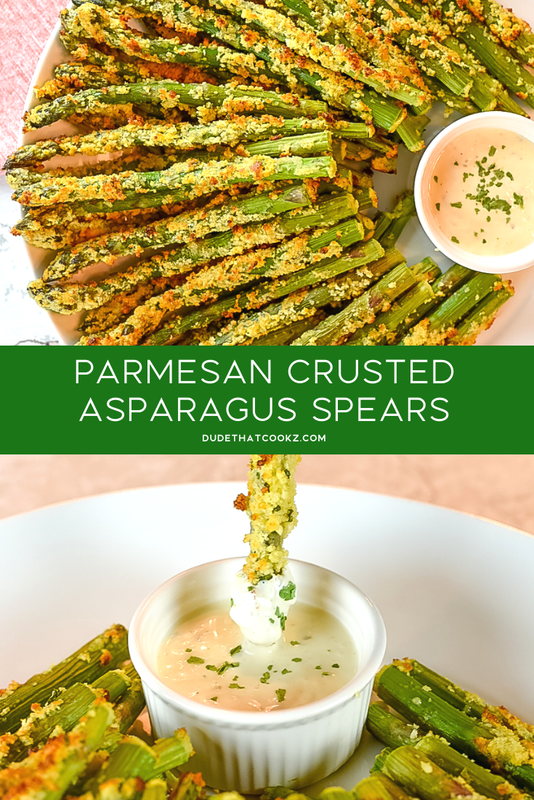 Baking these spears covered in the flavors you get from Parmesan cheese and the crunchy texture of panko breadcrumbs can not only make dinner time interesting, but it can actually be a great game day snack as well. 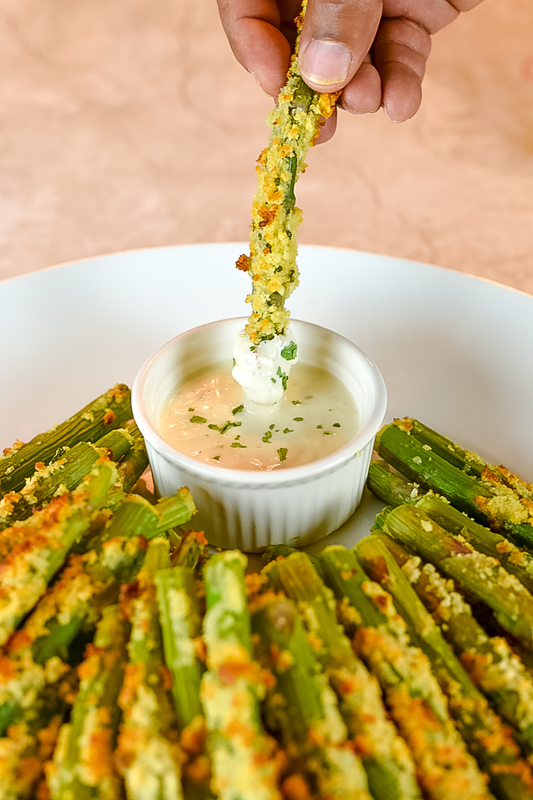 Dipping Parmesan Crusted Asparagus Spears in ranch dressing. 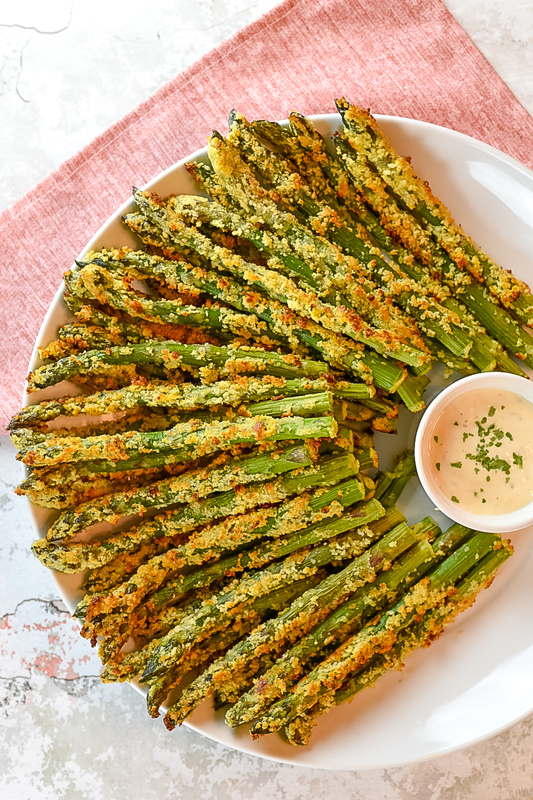 As we all try to find interesting ways to enjoy healthy recipes, this Parmesan Crusted Asparagus Spears is definitely one to bookmark. Wash the asparagus and cut the bottom ends of the spears. 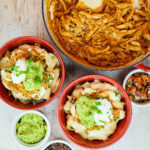 In a bowl, add eggs and whipping cream then whisk. 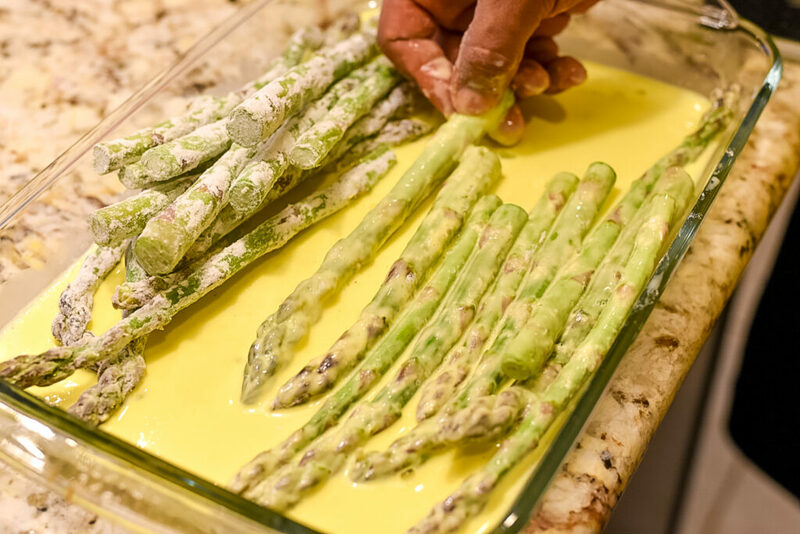 Add all purpose flour to a baking sheet and coat the asparagus with flour. Add coated asparagus to egg mixture and make sure it’s covered well. In a bowl, add Panko breadcrumbs and Parmesan cheese and roll asparagus until coated well. 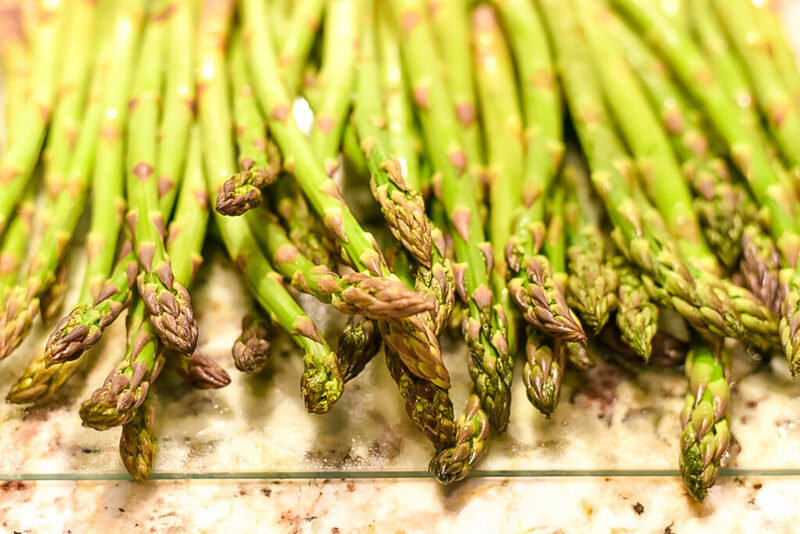 Place asparagus on baking sheet and cook for 6 minutes on the top oven rack then move to a lower rack for the last 6 minutes. Once done serve hot with ranch dressing (optional). Love this! They looks so crispy and yummy! Thanks for sharing! Thanks Karly! I think you would really enjoy these. Wow… you took this to a whole ‘nother level! Great presentation and pics.. I usually roast mine with olive oil and sprinkle with parmesan cheese but this here! Thanks Jamala I appreciate it!